The Permian basin in western Texas and eastern New Mexico is expected to account for more than half of the growth in crude oil production through 2019. Dallas Morning News photo. The United States Energy Information Administration’s August Short-Term Energy Outlook (STEO) forecasts that U.S. crude oil production will average 10.7 million barrels per day (b/d) in 2018 and 11.7 million b/d in 2019. If realized, both of these forecast levels would surpass the previous record of 9.6 million b/d set in 1970. This national increase is almost entirely driven by tight oil. In particular, the Permian region in western Texas and eastern New Mexico is expected to account for more than half of the growth in crude oil production through 2019. 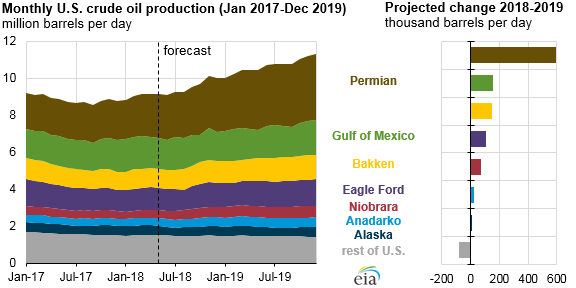 The EIA expects Permian regional production to average 3.3 million b/d in 2018 and 3.9 million b/d in 2019. Although favourable geology combined with technological and operational improvements have contributed to the Permian region becoming one of the more economically favourable regions for crude oil production in the United States, recent pipeline capacity constraints have dampened wellhead prices for the region’s oil producers. Lower wellhead prices in the region are contributing to slower growth in Permian crude oil production in 2019 compared with 2018. The agency forecasts Federal Offshore Gulf of Mexico (GOM) production to grow by 158,000 b/d in 2019 to average 1.9 million b/d, making this region the second-largest contributor to STEO’s forecast growth from 2018 to 2019. The forecast growth is driven by the ramping up of 2 new fields that started producing in 2017, the anticipation of 10 new fields starting up in 2018, and 6 new fields coming online in 2019. These 18 fields are expected to contribute 480,000 b/d of the total 1.9 million b/d of GOM production in 2019. The EIA expects the Bakken region to hit record-high production in 2018, averaging 1.3 million b/d and growing to 1.4 million b/d in 2019. Although the Bakken region is geographically large, spanning approximately 200,000 square miles in North Dakota and Montana, it contains fewer identified producing formations and is significantly more affected by winter weather than the Permian. The recent production growth in the Bakken has been supported by the removal of pipeline capacity constraints that affected the region before 2017. According to EIA forecasts, production in the Eagle Ford region in Texas to increase by about 105,000 b/d from 2018 to 2019 to average 1.5 million b/d. The Eagle Ford region covers a smaller geographic area with fewer prolific formations and fewer opportunities to drill compared with the Permian region. However, the Eagle Ford region does not have the same pipeline capacity constraints as the Permian region. The EIA anticipates that producers may move away from the Permian in mid-to-late 2018 and in 2019 into the Eagle Ford while the Permian region pipeline transport is constrained. Niobrara and Anadarko regional production is expected to average 670,000 b/d and 550,000 b/d, respectively, in 2019. The EIA forecasts that drilling activity will continue increasing in both of these regions through 2019, although at a slightly slower rate than in 2017 and 2018. Production in Alaska is forecast to remain steady, averaging 480,000 b/d in 2018 and 2019. In the rest of the United States, the EIA expects production to decline slightly (by 81,000 b/d) as a result of drilling activity that is insufficient to offset declining output from currently producing wells. If crude oil prices continue to increase, these areas could become more profitable, spurring the pace of drilling.